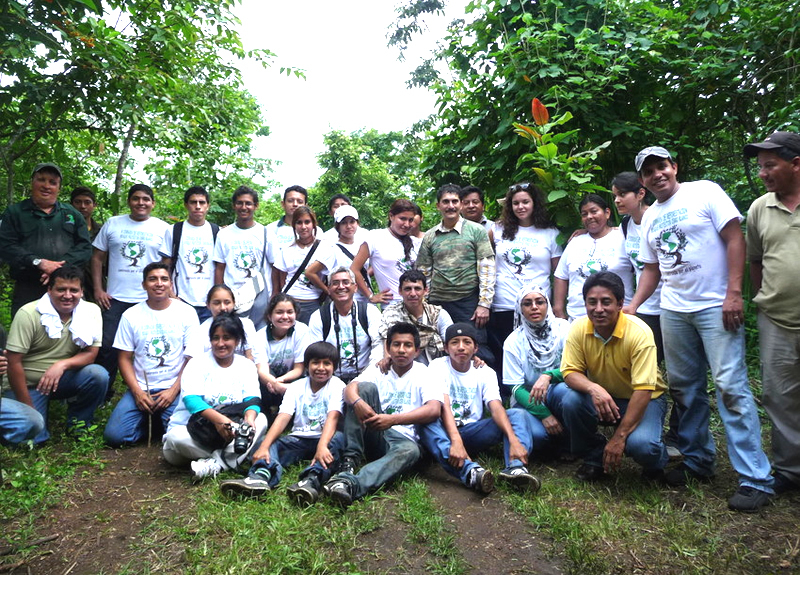 The volunteers at Pro-Bosque's 2011 reforestation day. 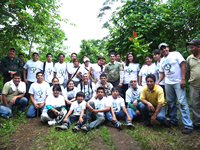 The volunteers are proudly wearing their Pro-Bosque T-shirts. Photo © Pro-Bosque. 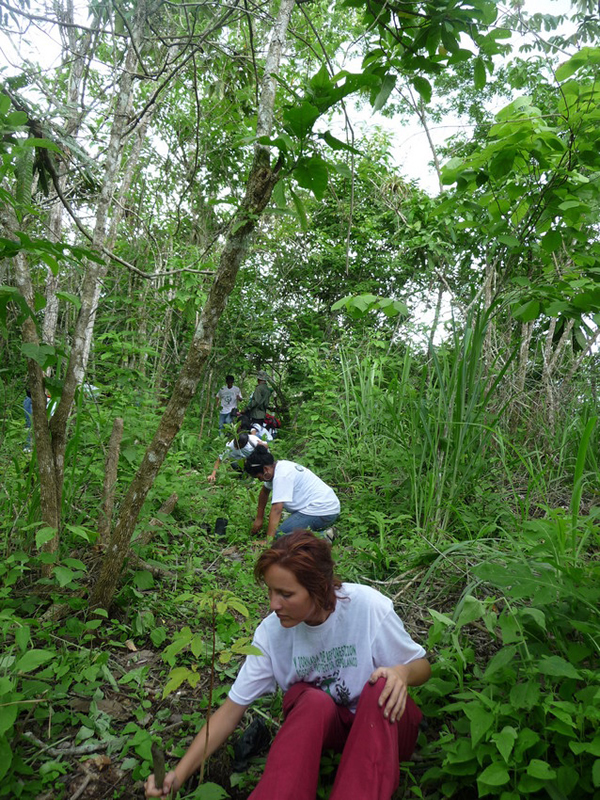 Volunteers tree planting in Cerro Blanco Protected Forest. The forest was cleared prior to protection by Pro-Bosque. Photo © Pro-Bosque. 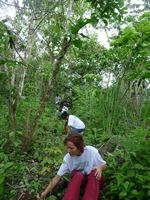 When carried-out using an appropriate mix of native species, with sensitivity to the ecology of the area and the needs of local communities, reforestation can be a powerful tool for restoring degraded and fragmented forest habitat, as well as creating buffer zones around key biodiversity hotspots. Slope stabilisation, reduced rates of soil erosion and improved hydrological flow are other benefits of reforestation, especially in upland areas. Tree-planting projects fail because many organisations do not have a strict process in place to do monitoring and secure the long-term success of the reforestation. This is largely because it is labour intensive, time consuming and costs money. Yet without a thoroughly researched method into long term management, tree-planting is often futile. Pro-Bosque employs a strict system of research, labour and maintenance to ensure the success of their reforestation programme. Much time is spent clearing unwanted vegetation to reduce competition and replacing any lost trees, either through planting or assisted natural regeneration. 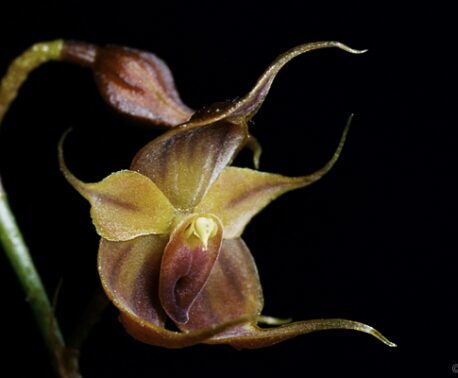 Important field observations and monitoring can be carried out at the same time, providing information on tree health and growth rates, vital for securing the long-term success of the on-going project. WLT currently runs reforestation programmes in four countries across three continents, advancing biodiversity conservation by restoring habitats. 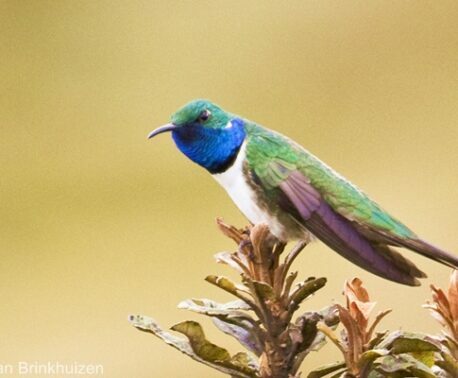 Our partner organisations, such as Fundación Pro-Bosque, are integral to the delivery of the programme and possess the detailed conservation knowledge to guarantee these biodiversity gains.